After six years of planning and fine-tuning her business strategy, Southern Illinois University Edwardsville alumnus Breon Green has opened the doors on her new beauty supply business, Divine Immanence LLC, in Maryville. A 2010 SIUE School of Business graduate in business, economics and finance, and a 2014 Webster University MBA graduate, Green’s long-term goal has been to own a business and to provide hair products that are primarily geared toward men and women of color. During her time at SIUE, Green chose a beauty supply shop as her company in a marketing class where she was required to author a business plan for a startup. From that point on, Green’s idea to meet this beauty-related need in the local market gained traction. Divine Immanence LLC is located in a 1,200-square-foot space at 23 Executive Plaza Court in Maryville. Green officially opened her business Saturday, Jan. 21. Hours are Thursdays from 5:30 p.m.-8:30 p.m., and Fridays and Saturdays from 10 a.m.-8 p.m. In 2016, Green resumed meetings with the Illinois Metro East Small Business Development Center at SIUE, receiving no-cost expertise from SBDC Interim Director Jo Ann DiMaggio May. For several months, the two communicated in person, by telephone and through email. May provided Green with expertise on perfecting Divine Immanence LLC’s business plan, how to secure a location for her shop and how to trademark her logo. May also referred Green to Justine PETERSEN, a St. Louis-based organization that provides credit building strategies and micro-loans to individuals and businesses whose financial situation does not meet traditional bank financing requirements. For more information about Divine Immanence LLC, call the shop at (618) 205-1115. 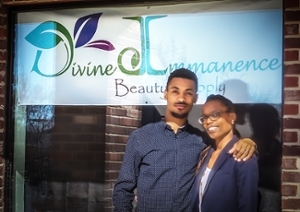 Photo: Entrepreneur Breon Green (right), an SIUE grad, and her husband Darrin Green opened her new business, Divine Immanence LLC, in January 21 at 23 Executive Plaza Court in Maryville.